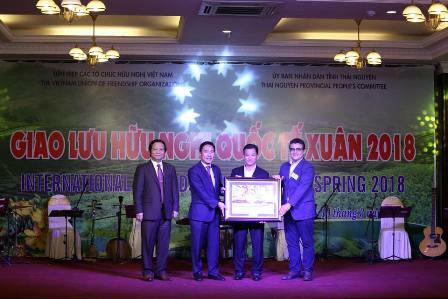 On behalf of the international friends, Ambassador Saadi Salama, Ambassador of the State of Palestine to Vietnam, Deputy Dean of the Diplomatic Corps, thanked VUFO and the leaders and people of Thai Nguyen province for organizing such a meaningful spring journey. Ambassador Saadi Salama said that the trip gave international visitors an opportunity to learn more about the culture and people of Vietnam, thereby enhancing the understanding and solidarity between Vietnam and other countries. Participants visited the Museum of Vietnam Ethnic Groups' Cultures, the Tan Cuong tea culture space centre and the ecology tea village in Thai Nguyen where they had chances to experience tea processing methods as well as special cultural practices of Thai Nguyen tea growers in the famous tea production hub of Tan Cuong.